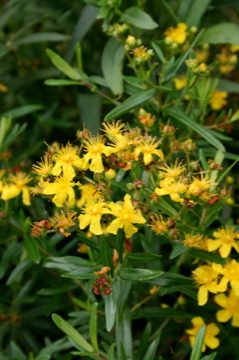 Hypericum perforatum, the European St. John's Wort is well known, and debated, as natural antidepressant that is widely sold as an herbal supplement. Some I know have taken and say that it is quite a boon during the short, dark days of the Midwestern winter. I have personally tried taking it internally, and truthfully have never found it to be as uplifting as simply enjoying the visual effects of the plant, whether photo or real thing. Through the course of my travels to study Phlox over the past two and half years, I have come across several Hypericum species. From an ornamental standpoint, many are insignificant and perhaps weedy, but some species are gems and others are great summer-flowering plants for tough planting areas. A plants that should be a staple of bative plant enthusiasts of the eastern and central U.S. is Hypericum sphaerocarpum. This taxon is relatively rare in Ohio and Kentucky, but becomes more common as one moves westward to Missouri and Arkansas. This species is frequent in barrens and prairie remnants, seemingly where there is disturbance from fire, and inhabits soil that is alkaline and prone to extremes of dryness in summer and wetness in winter. Think of this species as a ground cover rather than a specimen plant for tough areas where little else will grow. 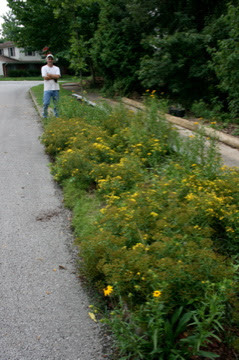 The golden yellow flowers of Hypericum sphaerocarpum appear are at their peak in July and August. This photo was taken on a day when it was already approaching 90 fahrenheit at 9 AM. They have the classic St. john's Wort look. Not the greatest photo in the world, but this clearly shows the mounding habit of H. sphaerocarpum growing here with Phlox bifida ssp. stellaria (not flowering here). Here is a landscape shot of H. sphaerocarpum growing in a tree lawn in a Lexington, Kentucky suburb and pictured with the proud owner ( a famous kentucky botanist). This clearly demonstrates the utility of this plant as a ground cover and choice native plant replacement for over planted turf grass species. Another native St. John's species I ran into on a later trip was described to me Hypericum godfreyi from at least the Florida panhandle and perhaps adjacent areas. This name is not formally accepted and this taxon is being split from a more widely circumscribed Hypericum species that is escaping me at the moment. Despite this, H. godfreyi is intriguing to me because it is one of the most frequent congeners of Lilium iridollae, the panhandle lily. Here is the Rosemary-like foliage of H. godfreyi, just past peak flowering in early August and growing along a river in the Florida panhandle. 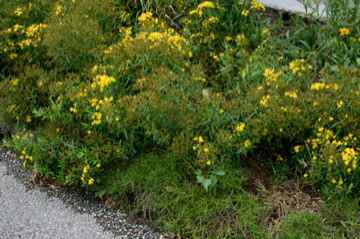 A "clump" of Hypericum godfreyi. Note that the plants are flowering, but just past their peak. As you can see, this species grows in acidic, saturated soils and may have potential for landscapes with similar conditions or as a plant used for conservation plantings. Here is a "hedge" of H. godfreyi forming a barrier between a spring fed creek and ancient specimens of Bald Cypress (Taxodium distichum) in the Florida Panhandle.